How to rename or delete groups and how to edit the rules of the smart groups. 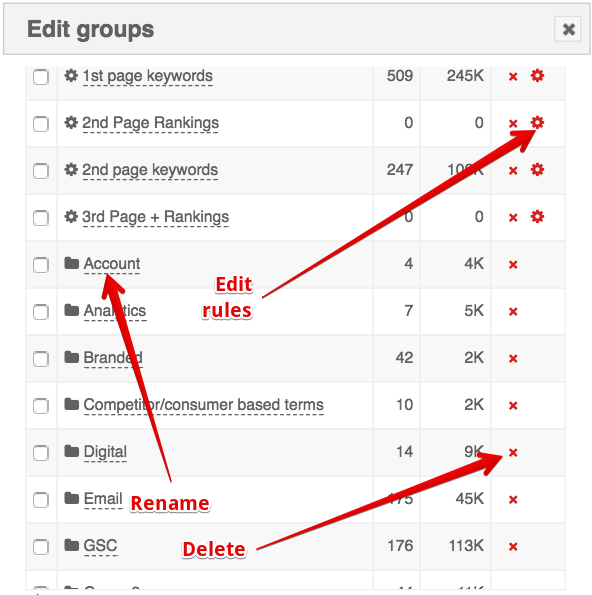 You can edit or delete keyword groups in the SEO Campaign module. To edit your groups, click on the pencil icon in the upper left corner. edit the rules (for smart groups) by clicking on the settings wheel. Deleting a group does not delete its keywords. They will continue to be monitored in other groups (if they had been previously added there) or in an automatically generated group called Ungrouped.